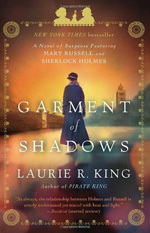 Author Laurie King brings her hero Mary Russell, wife of Sherlock Holmes, to Morocco during a particularly chaotic time. The French under the 1912 treaty have been allowed to form a Protectorate to control the South and keep Sultan Yusef in place as the nominal ruler. The Spanish were allowed to control the North, while the Atlas Mountains were in effect controlled by Berber tribal groups struggling to maintain their independence. In the mix were Germans, determined to take control of Moroccos valuable iron ore mines, and the English who had their spies to ensure that a weak power, like Spain, maintain in charge of a land a "cannons shot from Gibraltar." What a mess! Mary has arrived as part of movie studio. When she mysteriously leaves the film encampment and disappears, Sherlock is brought into the story to help find her. Meanwhile, Mary is caught up in the struggles between the French forces and the dangerous predations of Raisuli, the last of the Berber pirates. Since she cannot appear in public asking questions as a woman, she assumes male garb for much of the story. In this way the "male" Mary wanders about vividly describing the sights and sounds of Morocco. The Fez suq particularly enchants: "Its a world Id never have guessed existed," she muses. And, although Fez has a tight-knit and age-old community, it also has "dark trouble at its edges." When needed Mary manages to disarm male aggression. She is fluent in three of the languages spoken in Morocco and is able to wield all sorts of weapons, including her hairpins. The storys introduction of a nurse, Peg Taylor, based on Miss Sophie Denison who lived for years in Fez and wrote about the lives of Moorish women is a nice touch. It is lamentable, however, that not more is made of the lively world of Moroccan women. And, Kings devise of having her hero wander about in a faze, recovering at different times from two almost fatal mishaps, limits the storys suspense. The Author Notes as always provide valuable, much needed historical information.